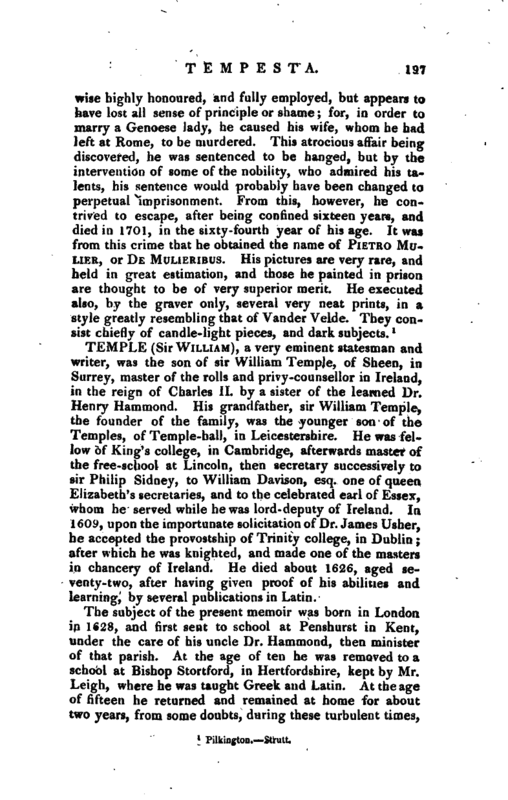 , a very eminent statesman and writer, was the son of sir William Temple, of Sheen, in Surrey, master of the rolls and privy-counsellor in Ireland, 1 in the reign of Charles II. by a sister of the learned Dr.‘ Henry Hammond. His grandfather, sir William Temple, the founder of the family, was the younger son of the Temples, of Temple-hall, in Leicestershire. He was fellow of King’s college, in Cambridge, afterwards master of the free-school at Lincoln, then secretary successively to sir Philip Sidney, to William Davison, esq. one of queen Elizabeth’s secretaries, and to the celebrated earl of Essex, whom he served while he was lord-deputy of Ireland. 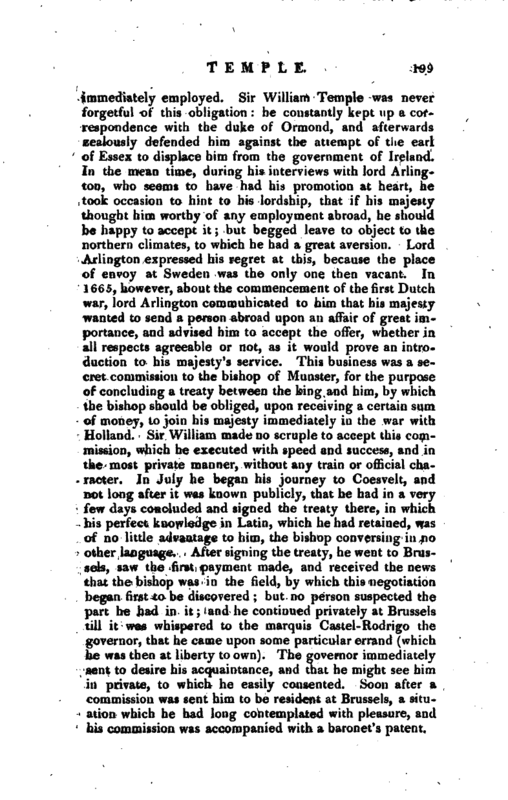 In 1609, upon the importunate solicitation of Dr. James Usher, he accepted the provostship of Trinity college, in Dublin; after which he was knighted, and made one of the masters in chancery of Ireland. He died about 1626, aged sevetity-two, after having given proof of his abilities and learning, by several publications in Latin. The subject of the present memoir was born in London in 1628, and first sent to school at Penshurst in Kent, under the care of his uncle Dr. Hammond, then minister of that parish. At the age of ten he was removed to a school at Bishop Stortford, in Hertfordshire, kept by Mr. Leigh, where he was taught Greek and Latin. At the age of fifteen he returned and remained at home for about two years, from some doubts, during these turbulent times, | as to the propriety of sending him to any university. These having been removed, he was about two years after entered of Emanuel college, Cambridge, under the tuition of the learned Cud worth. His father intending him for political life, seems not to have thought a long residence here necessary; and therefore about 1647, or 1648, sent him on his travels. While on his way to France he visited the Isle of Wight, where his majesty Charles I. was then a prisoner; and there formed an attachment to Dorothy, second daughter of sir Peter Osborn, of Chicksand, in Bedfordshire, whom he afterwards married. His travels extended to France, Holland, Flanders, and Germany; during which he acquired a facility in speaking and reading those modern languages, which then formed a necessary accomplishment in a statesman. In 1654, on his return, he married the above-mentioned Mrs. Osborn, and passed his time for some years with his father and family in Ireland, improving himself in the study of history and philosophy, and cautiously avoiding any employment during the usurpation. At the restoration, in 1660, he was chosen a member of the convention in Ireland, and first distinguished himself by opposing the poll-bill, a very unpopular ministerial measure; which he did with so much independence of spirit, as to furnish a presage of his future character. In the succeeding parliament, in 1661, he was chosen, with his father, for the county of Carlow, where he distinguished himself by voting and speaking indifferently, as he approved or disapproved their measures, without joining any party. In 1662 he was chosen one of the commissioners to be sent from that parliament to the king, and took this opportunity of waiting on the lord lieutenant, the duke of Ormond, then at London, and seems at the same time to have now formed the design of quitting Ireland altogether, and residing in England. 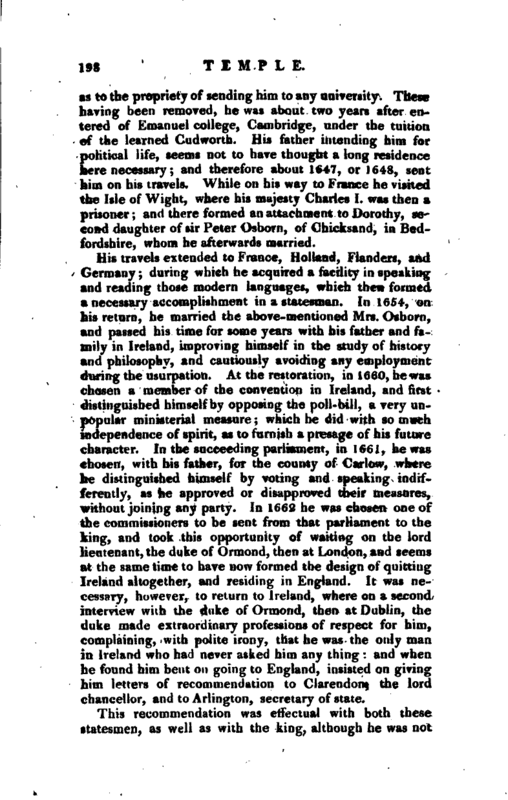 It was necessary, however, to return to Ireland, where on a second interview with the duke of Ormond, then at Dublin, the duke made extraordinary professions of respect for him, complaining, with polite irony, that he was the only man in Ireland who had never asked him any thing: and when he found him bent on going to England, insisted on giving him letters of recommendation to Clarendon, the lord chancellor, and to Arlington, secretary of state. This recommendation was effectual with both these statesmen, as well as with the king, although he was not | immediately employed. Sir William Templew^s nev.er forgetful of this obligation he constantly kept np a Correspondence with the duke of Ormond, and afterwards zealously defended him against the attempt of the earl of Essex to displace him from the government of Ireland. In the mean time, during his interviews with lord Arling­‘ton, who seems to have had his promotion at heart, he took occasion to hint to his lordship, that if his majesty thought him worthy of any employment abroad, he should be happy to accept it; but begged leave to object to the northern climates, to which he had a great aversion. Lord Arlington expressed his regret at this, because the place of envoy at Sweden was the only one then vacant. In 1665, however, about the commencement of the first Dutch, war, lord Arlington communicated to him that his majesty wanted to send a person abroad upon an affair of great importance, and advised him to accept the offer, whether in all respects agreeable or not, as it would prove an introduction to his majesty’s service, This business was a secret commission to the bishop of Munster, for the purpose of concluding a treaty between the king and him, by which the bishop should be obliged, upon receiving a certain sum of money, to join his majesty immediately in the war with Holland. Sir William made no scruple to accept this commission, which he executed with speed and success, and in the most private manner, without any train or official character. In July he began his journey to Qoesvelt, and not long after it was known publicly, that he had in a very few days concluded and signed the treaty there, in which his perfect knowledge in Latin, which he had retained, was of no little advantage to him, the bishop. conversing in no other language. After signing the treaty, he went to Brussels, saw the first payment made, and received the news that the bishop was in the fielfl, by which this negotiation began first to be discovered;, but no person suspected ’the part he had in it; and he continued privately at Brussels till it was whispered to the marquis Castel-Rodrigo the governor, that he came upon some particular errand (-which he was then at liberty to own). The governor immediately sent to desire his acquaintance, and that he might see him in private, to which he easily consented. Soon after a commission was sent him to be resident at Brussels, a situation which he had long contemplated with pleasure, and his commission was accompanied with a baronet’s patent. | Sir William now sent for his family (April 1666); but, before their arrival, was again ordered to Munster, to prevent the bishop’s concluding peace with the Dutch, which he threatened to do, in consequence of some remissness in the payments from England, and actually signed it at Cleve the very night sir William Temple arrived at Munster. On. this he returned to Brussels; and before he had been there a year, peace with the Dutch was concluded at Breda. Two months after this event, his sister, who resided with him at Brussels, having an inclination to see Holland, he went thither with her incognito, and while at the Hague, became acquainted with the celebrated Pensionary De Witt. In 167’3, the king, becoming weary of the second Dutch war, and convinced of its unpopularity, sent for sir William Temple, and wished him to go to Holland, with the offer of the king’s mediation between France and the confederates then at war, which was not long after accepted; and in June 1674, lord Berkley, sir William Temple, and | sir Lioline Jenkins, were declared ambassadors and mediators, and Nimeguen appointed, by general consent, as the place of treaty. During sir William’s stay at the Ha^ne, the prince of Orange, who was fond of speaking English, and of English habits, constantly dined and supped once or twice a week at his house, feir William insensibly acquired his Highness’s confidence, and had a considerable hand in his marriage with the princess Mary, of which he has said so much in his " Memoirs. 77 One instance of his employing his influence with the prince, he used to reckon amongst the good fortunes of his life. Five Englishmen happened to be taken and brought to the Hague whilst he was there, and in the prince’s absence, who were immediately tried, and condemned by a council of war, for deserting their colours: some of his servants had the curiosity to visit their unfortunate countrymen, and came home with a deplorable story, that, by what they had heard, it seemed to be a mistake; and that they were all like to die innocent; but, however, that it was without remedy, that their graves were digging, and they were to be shot next morning. Sir William Temple left nothing unattempted to prevent their sudden execution; and sent to the officers to threaten them, that he would complain first to the prince, and then to the king, who, he was sure, would demand reparation, if so many of his subjects suffered unjustly: but nothing would move them, till he made it his last request to reprieve them one day, during which the prince happened to come within reach of returning an answer to a message he sent, and they were released. The first thing they did was to go and look at their graves; and the next, to come and thank sir William Temple upon their knees. 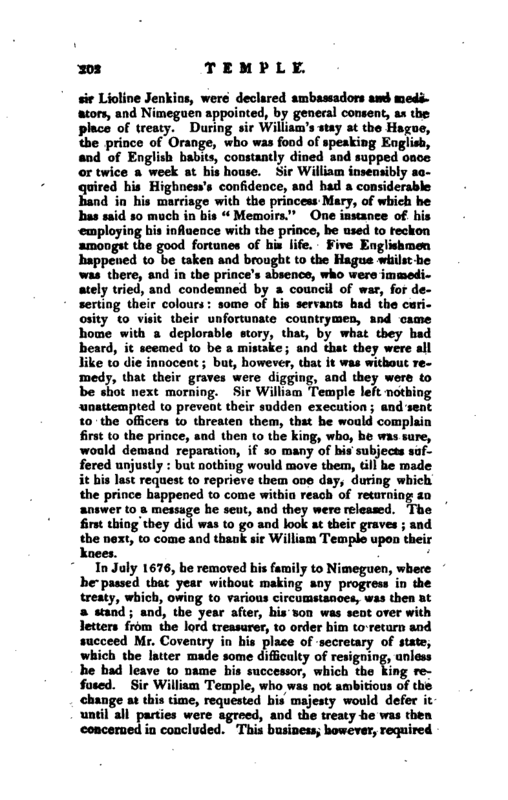 In July 1676, he removed his family to Nimeguen, where he passed that year without making any progress in the treaty, which, owing to various ircumstances, was then at a stand; and, the year after, his son was sent over with letters from the lord treasurer, to order him to return and succeed Mr. Coventry in his place of secretary of state, which the latter made some difficulty of resigning, unless he had leave to name his successor, which the king refused. Sir William Temple, who was not ambitious of the change at this time, requested his majesty would defer it until all parties were agreed, and the treaty he was then concerned in concluded. This business, however, required | his presence in England, and he did not return to Nimeguen that year. 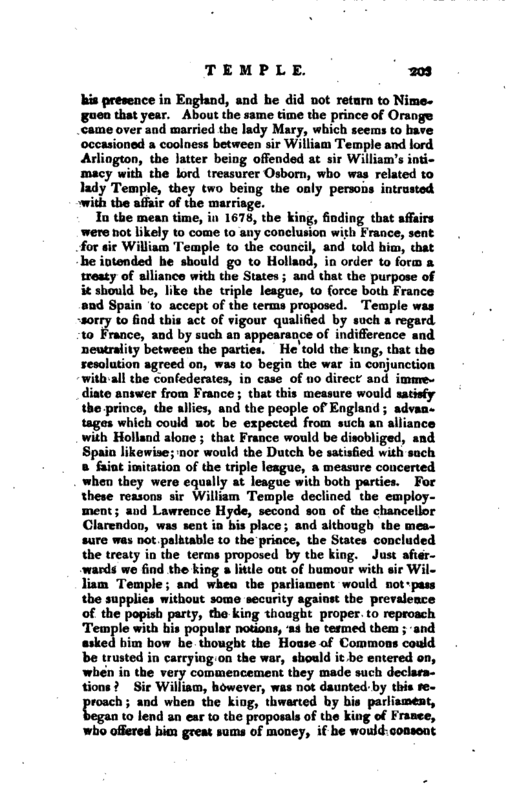 About the same time the prince of Orange came over and married the lady Mary, which seems to have occasioned a coolness between sir William Temple and lord Arlington, the latter being offended at sir William’s intimacy with the lord treasurer Osborn, who was related to lady Temple, they two being the only persons intrusted with the affair of the marriage. In the mean time, in 1678, the king, finding that affairs were riot likely to come to any conclusion with France, sent for sir William Temple to the council, and told him, that he intended he should go to Holland, in order to form a treaty of alliance with the States; and that the purpose of it should be, like the triple league, to force both France and Spain to accept of the terms proposed. Temple was sorry to find this act of vigour qualified by such a regard to France, and by such an appearance of indifference and neutrality between the parties. He told the king, that the resolution agreed on, was to begin the war in conjunction with all the confederates, in case of no direct and immediate answer from France; that this measure would satisfy the prince, the allies, and the people of England; advantages which couid not be expected from such an alliance with Holland alone; that France would be disobliged, and Spain likewise; nor would the Dutch be satisfied with such a faint imitation of the triple league, a measure concerted when they were equally at league with both parties. For these reasons sir William Temple declined the employment; and Lawrence Hyde, second son of the chancellor Clarendon, was sent in his place; and although the measure was not palatable to the prince, the States concluded the treaty in the terms proposed by the king. Just afterwards we find the king a little out of humour with sir William Temple; and when the parliament would not pass the supplies without some security against the prevalence of the popish party, the king thought proper to reproach Temple with his popular notions, as he termed them; and asked him how he thought the House of Commons could be trusted in carrying on the war, should it be entered on, when in the very commencement they made such declarations? 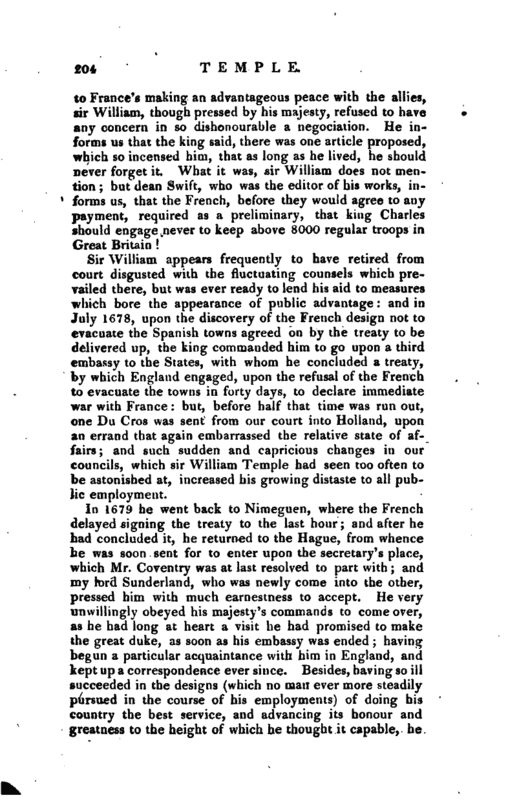 Sir William, however, was not daunted by this reproach; and when the king, thwarted by his parliament, began to lend an ear to the proposals of the king of France, who offered him great sums of money, if he would consent | to France’s making an advantageous peace with the allies, sir William, though pressed by his majesty, refused to have any concern in so dishonourable a negociation. 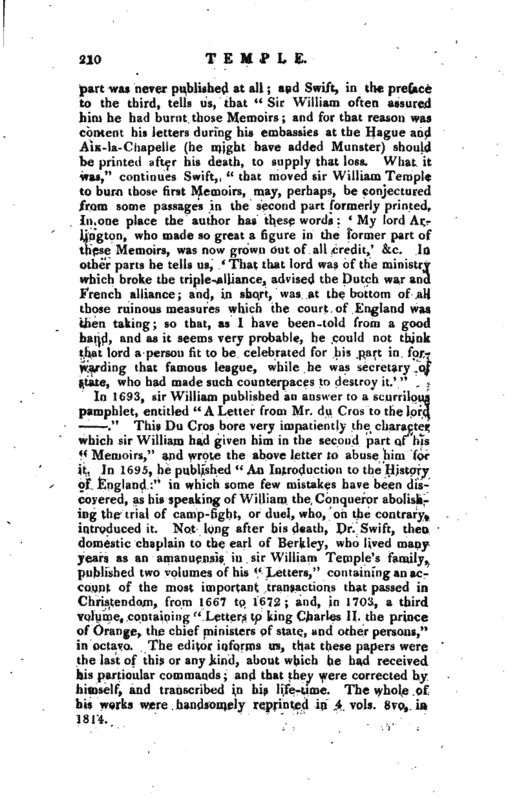 He informs us that the king said, there was one article proposed, which so incensed him, that as long as he lived, he should never forget it What it was, sir William does not mention; but dean Swift, who was the editor of his works, informs us, that the French, before they would agree to any payment, required as a preliminary, that king Charles should engage never to keep above 8000 regular troops in Great Britain! Sir William appears frequently to have retired from court disgusted with the fluctuating counsels which prevailed there, but was ever ready to lend his aid to measures which bore the appearance of public advantage: and in July 1678, upon the discovery of the French design not to evacuate the Spanish towns agreed on by the treaty to be delivered up, the king commanded him to go upon a third embassy to the States, with whom he concluded a treaty, by which England engaged, upon the refusal of the French to evacuate the towns in forty days, to declare immediate war with France: but, before half that time was run out, one Du Cros was sent from our court into Holland, upon an errand that again embarrassed the relative state of affairs; and such sudden and capricious changes in our councils, which sir William Temple had seen too often to be astonished at, increased his growing distaste to all public employment. 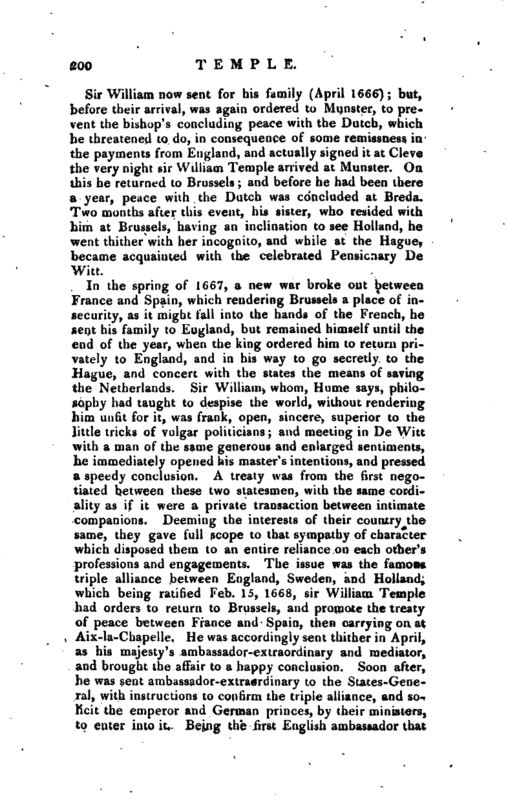 In 1679 he went back to Nimeguen, where the French delayed signing the treaty to the last hour; and after he had concluded it, he returned to the Hague, from whence he was soon sent for to enter upon the secretary’s place, which Mr. Coventry was at last resolved to part with and my lord Sunderland, who was newly come into the other, pressed him with much earnestness to accept. He very unuillingly obeyed his majesty’s commands to come over, as he had long at heart a visit he had promised to make the great duke, as soon as his embassy was ended; having begun a particular acquaintance with him in England, and kept up a correspondence ever since. Besides, having so ill succeeded in the designs (which no man ever more steadily pursued in the course of his employments) of doing his country the best service, and advancing its honour and greatness to the height of which he thought it capable, he | resolved to ask leave of the king to retire. At this time, indeed, no person could engage in public affairs with a worse prospect; the Popish plot being newly broke out, and the parliament violent in the persecution of it, although it is now generally allowed to have been an absurd imposture. 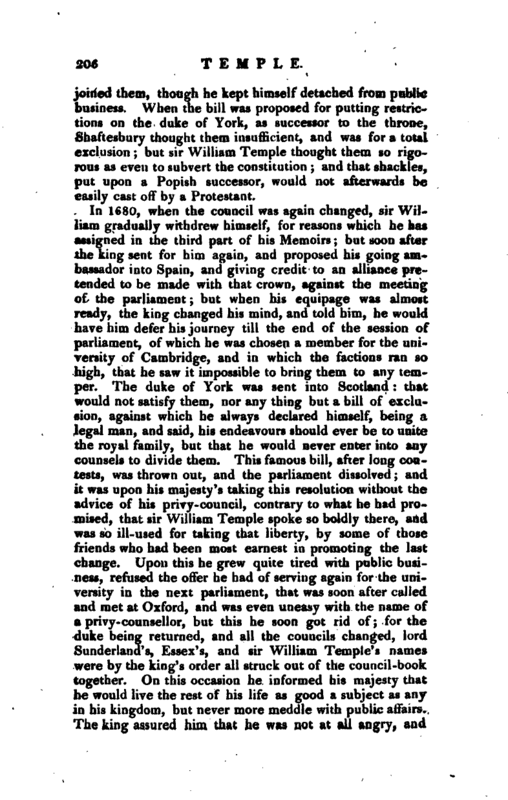 On these accounts, although the king, who, after the removal of the lord treasurer Danby, whom the parliament sent to the Tower, had no one with whom he could discourse with freedom on public affairs, sir William, alarmed at the universal discontents and jealousies which prevailed, was determined to make his retreat, as soon as possible, from a scene which threatened such confusion. Meanwhile, as he could not refuse the confidence witfi which his master honoured him, he represented to the king, that, as the jealousies of the nation were extreme, it was necessary to cure them by some new remedy, and to restore that mutual confidence, so requisite for the safety both of the king and people; that to refuse every thing to the parliament in their present disposition, or to yield every thing, was equally dangerous to the constitution, as well as to public tranquillity; that if the king would introduce into his councils such men as enjoyed the confidence of his people, fewer concessions would probably be re-. 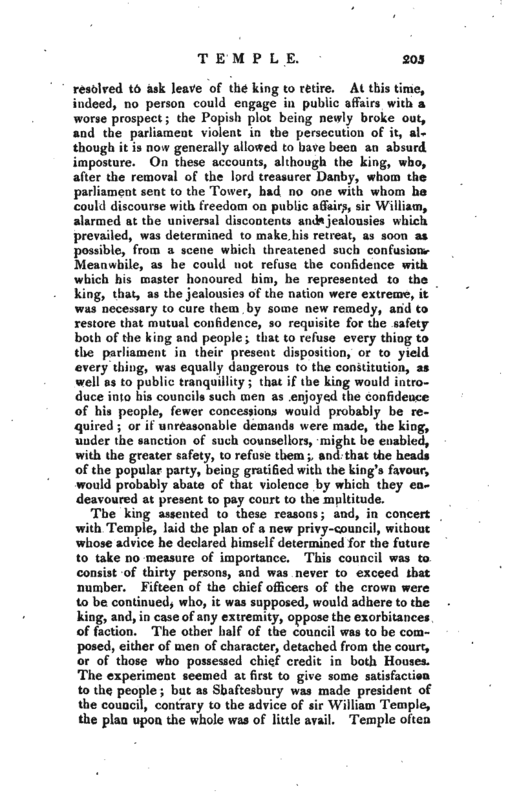 quired; or if unreasonable demands were made, the king, under the sanction of such counsellors, might be enabled, with the greater safety, to refuse them; and that the heads of the popular party, being gratified with the king’s favour, wouldprobably abate of that violence by which they endeavoured at present to pay court to the multitude. The king assented to these reasons; and, in concert with Temple, laid the plan of a new privy-council, without whose advice he declared himself determined for the future to take no measure of importance. This council was to consist of thirty persons, and was never to exceed that number. Fifteen- of the chief officers of the crown were to be continued, who, it was supposed, would adhere to the king, and, in case of any extremity, oppose the exorbitances of faction. The other half of the council was to be’composed, either of men of character, detached from the court, or of those who possessed chief credit in both Houses. The experiment seemed at first to give some satisfaction to the people; but as Shaftesbury was made president of the council, contrary to the advice of sir William Temple, the plan upon the whole was of little avail. Temple oftea | joined them, though he kept himself detached from public business. When the bill was proposed for putting restrictions on the duke of York, as successor to the throne, Shaftesbury thought them insufficient, and was for a total exclusion; but sir William Temple thought them so rigorous as even to subvert the constitution; and that shackles, put upon a Popish successor, would not afterwards be easily cast off by a Protestant. In 1680, when the council was again changed, sir William gradually withdrew himself, for reasons which he has assigned in the third part of his Memoirs; but soon after the king sent for him again, and proposed his going ambassador into Spain, and giving credit to an alliance pretended to be made with that crown, against the meeting of the parliament; but when his equipage was almost ready, the king changed his mind, and told him, he would have him defer his journey till the end of the session of parliament, of which he was chosen a member for the university of Cambridge, and in which the factions ran so high, that he saw it impossible to bring them to any temper. The duke of York was sent into Scotland: that would not satisfy them, nor any thing but a bill of exclusion, against which he always declared himself, being a legal man, and said, his endeavours should ever be to unite the royal family, but that he would never enter into any counsels to divide them. This famous bill, after long contests, was thrown out, and the parliament dissolved; and it was upon his majesty’s taking this resolution without the advice of his privy-council, contrary to what he had promised, that sir William Temple spoke so boldly there, and was so ill-used for taking that liberty, by some of those friends who had been most earnest in promoting the last change. Upon this he grew quite tired with public business, refused the offer he had of serving again for the university in the next parliament, that was soon after called and met at Oxford, and was even uneasy with the name of a privy-counsellor, but this he soon got rid of; for the duke being returned, and all the councils changed, lord Sunderland’s, Essex’s, and sir William Temple’s names were by the king’s order all struck out of the council-book together. On this occasion he informed his majesty that he would live the rest of his life as good a subject as any in his kingdom, but never more meddle with public affairs. 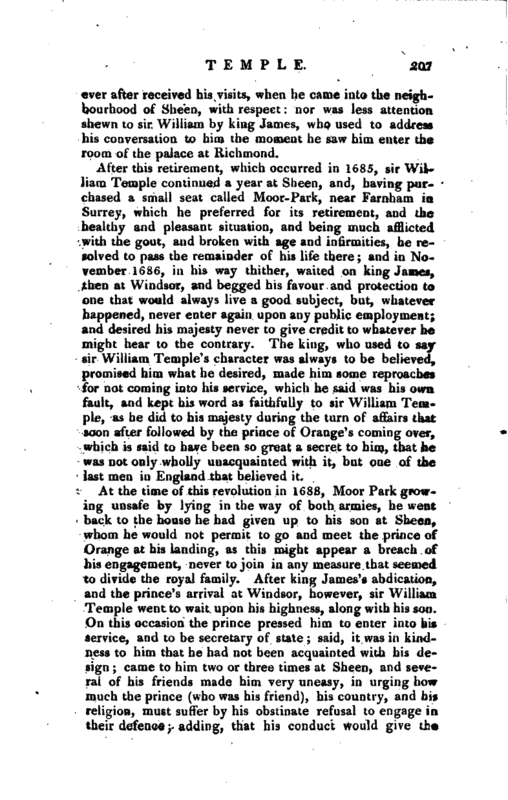 The king assured him that he was not at all angry, and | ever after received his visits, when he came into the neighbourhood of Sheen, with respect: nor was less attention shewn to sir William by king James, who used to address his conversation to him the moment he saw him enter the room of the palace at Richmond. After this retirement, which occurred in 1685, sir William Temple continued a year at Sheen, and, having purchased a small seat called Moor-Park, near Farnham in Surrey, which he preferred for its retirement, and the healthy and pleasant situation, and being much afflicted with the gout, and broken with age and infirmities, he resolved to pass the remainder of his life there; and in November 16 86, in his way thither, waited on king James, then at Windsor, and begged his favour and protection to one that would always live a good subject, but, whatever happened, never enter again upon any public employment; and desired his majesty never to give credit to whatever he might hear to the contrary. 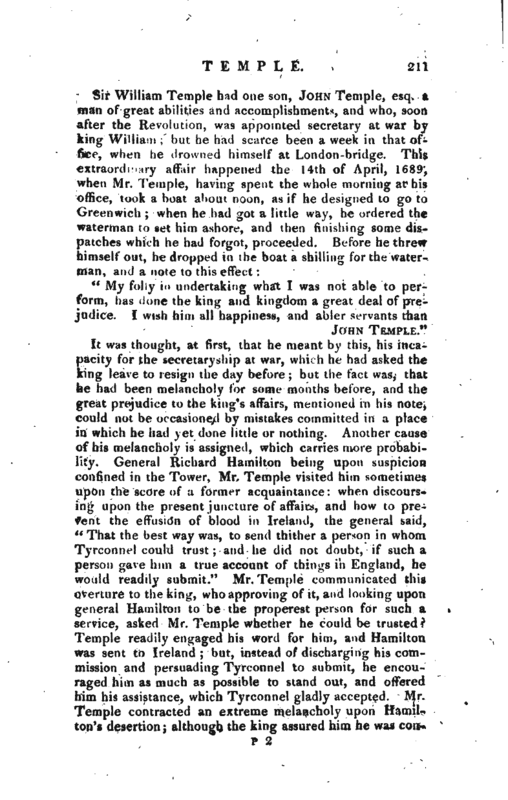 The king, who used to say sir William Temple’s character was always to be believed, promised him what he desired, made him some reproaches for not coming into his service, which he said was his own fault, and kept his word as faithfully to sir William Temple, as he did to his majesty during the turn of affairs that soon after followed by the prince of Orange’s coming over, which is said to have, been so great a secret to him, that he was not only wholly unacquainted with it, but one of the last men in England that believed it. At the time of this revolution in 1688, Moor Park growing unsafe by lying in. the way of both armies, he went back to the house he had given up to his son at Sheen, whom he would not permit to go and meet the prince of Orange at his landing, as this might appear a breach of his engagement, never to join in any measure that seemed to divide the royal family. 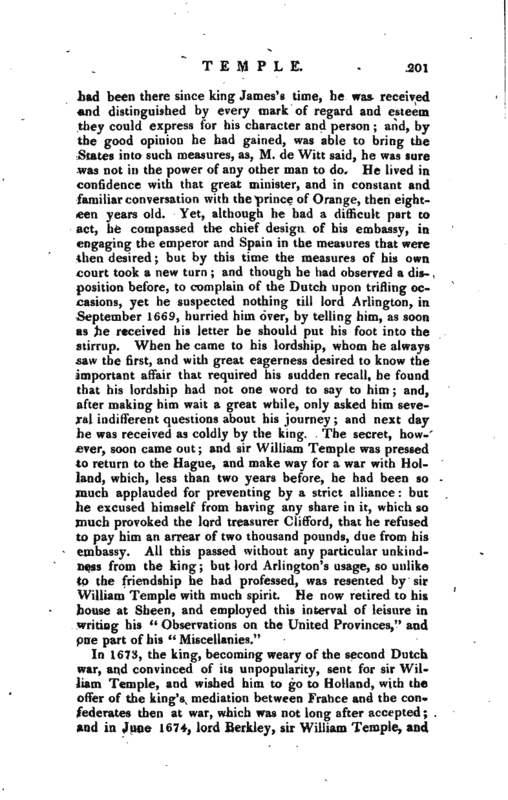 After king James’s abdication, and the prince’s arrival ut Windsor, however, sir William Temple went to wait upon his highness, along with his son. On this occasion the prince pressed him to enter into his service, and to be secretary of state; said, it was in kindness to him that he had not been acquainted with his design; came to him two or three times at Sheen, and several of his friends made him very uneasy, in urging how much the prince. (who was his friend), his country, and his religion, must suffer by his obstinate refusal to engage in their defence; add ing, that his conduct would give the | world an unfavourable opinion of this great undertaking, and make them mistrust some bad design at the bottom, which a man of his truth and honour did not care to be concerned in. Sir William, however, continued unshaken in his resolutions, although very sensible of the trouble and uneasiness the prince and all his friends expressed; and was the more anxious to return to his retirement at Moor Park, about the end of 1689, that he might be less exposed to similar solicitations. 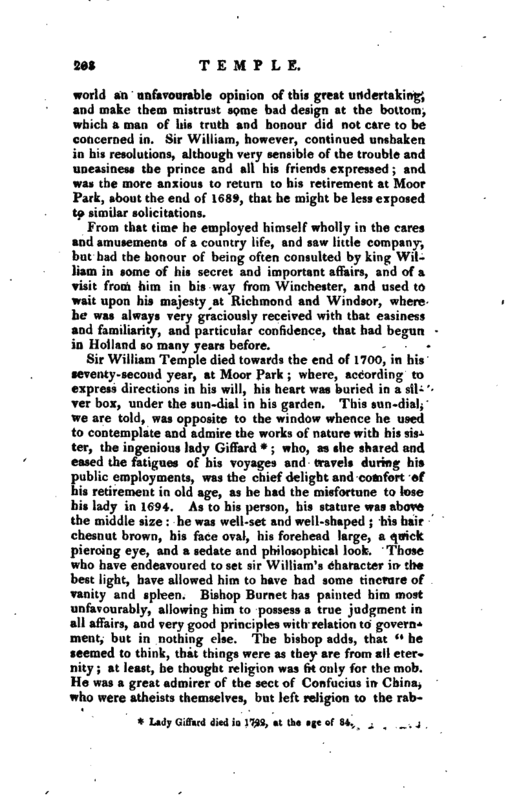 From that time he employed himself wholly in the cares and amusements of a country life, and saw little company, but had the honour of being often consulted by king William in some of his secret and important affairs, and of a visit from him in his way from Winchester, and used to wait upon his majesty at Richmond and Windsor, where he was always very graciously received with that easiness and familiarity, and particular confidence, that had begun in Holland so many years before. Lady Giffard died in 1722, at the age of 84. Biog. Brit.—Life prefixed to the early edition of his Works. Swift’s Works. 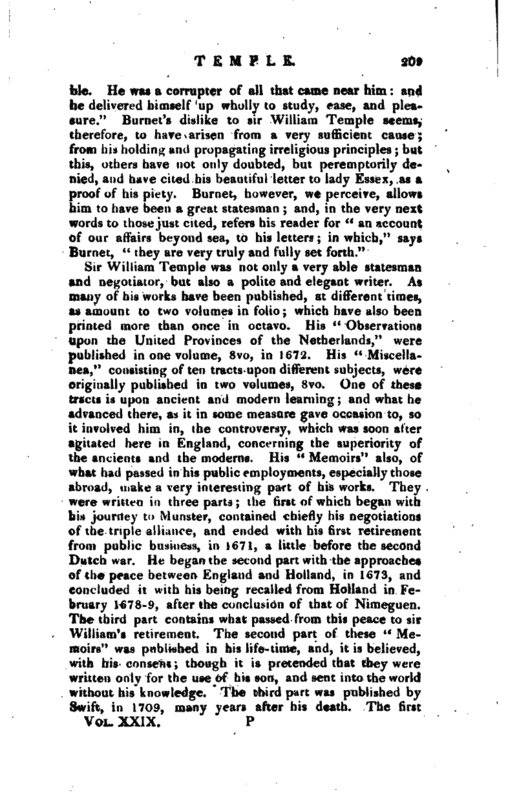 See Index.—Burnet’s Own Times.—Life prefixed to the edition of Temple’s Works, 1814, 8vo, enlarged by the editor.